US real estate investment trusts (REIT) have delivered impressive returns thus year. 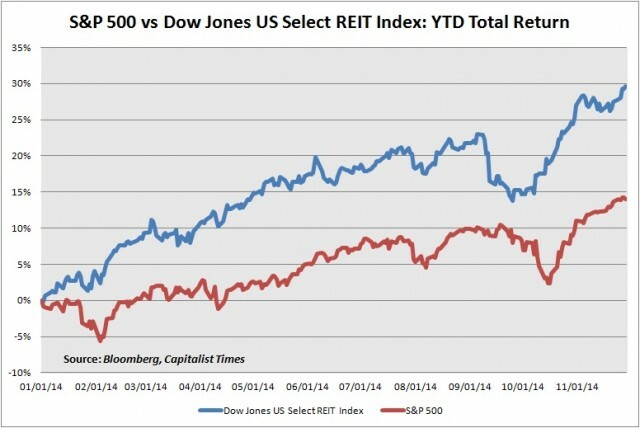 As of Nov. 28, the 91-member Dow Jones US Select REIT Index has rewarded investors with a 26 percent gain, easily besting the S&P 500’s almost 14 percent return. Investors who put in the time and effort to do their own shopping in the REIT space could have fared even better. And Digital Realty Trust (NYSE: DLR), which we added to our Lifelong Income Portfolio, on Feb. 28, has outperformed the popular REIT index by an almost 2-to-1 margin. 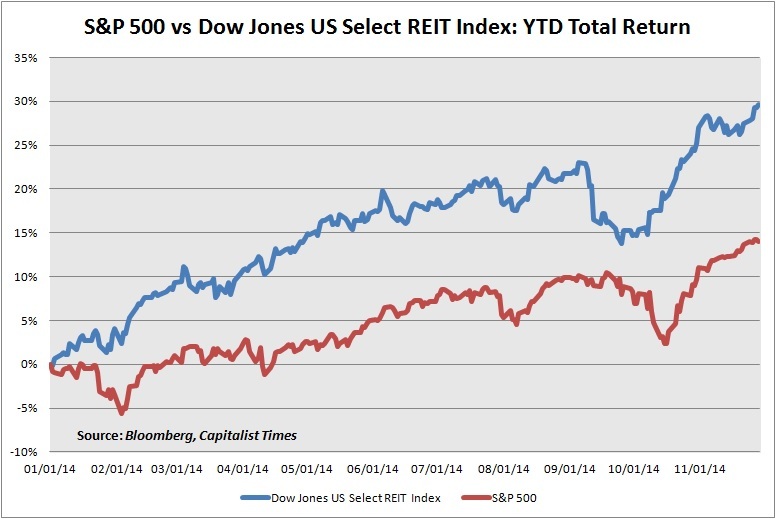 Why Have US REITs Outperformed This Year? 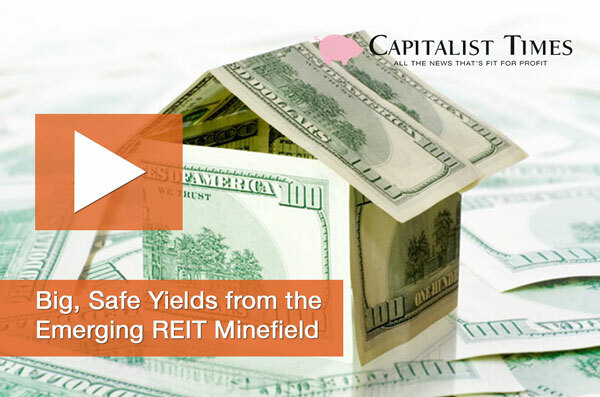 Many investors rotated out of REITs in the back half of 2013 because of concerns that rising interest rates would increase interest expense, constrain future growth and reduce the value of the dividends that these companies disburse to shareholders. This selling pressure landed several high-quality names in the bargain bin for the first time in years. As we pointed out in What’s Interest Rate Sensitive and What’s Not, REITs’ annual returns exhibit scant correlation to changes in the yield on 10-year Treasury notes; at the end of the day, economic conditions and company-specific drivers are far more important. Changes in interest rates are meaningful only insofar as they affect borrowing costs and earnings. 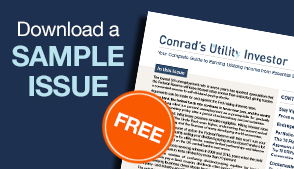 To date, REITs can still access low-cost debt capital, providing support for future growth. A strengthening US economy and low-cost debt capital should enable well-run REITs to deliver solid cash flow growth in 2015, helping to fuel dividend increases and share price appreciation. But not every US REIT has fared well in recent years. Although the Dow Jones US Select REIT Index has grown its dividends by a solid 4.3 percent, some index members’ payouts have stagnated or even declined. A lack of dividend growth hasn’t held back the performance of the industry’s heavyweights. Even though Boston Properties (NYSE: BXP) hasn’t raised its payout over the past two years, the stock has still rallied by 36 percent over this period. And the company isn’t expected to hike its dividend next year, either. This disconnection between business performance and the stock’s sizzling gains suggests that technical factors have fueled returns. For example, many investors piled back into REITs after the threat of rising interest rates diminished. With low energy prices bolstering the US economy and plenty of low-cost debt capital available, REITs should benefit from improving fundamentals and income-seeking investors rotating into the space from the energy sector. However, popular exchange-traded funds (ETF) that offer one-stop exposure to US REITs face at least two emerging headwinds. 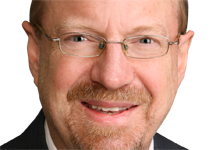 The Dow Jones US Select REITs Index offers a current return of 3.2 percent—its lowest yield this year—providing little cushion if fears of rising interest rates prompt investors to rotate out of this security class. If momentum does shift from REITs, expect the Dow Jones US Select REITs Index and the popular ETFs that track this basket of stocks to revisit last year’s lows in short order. And because these indexes and ETFs are capitalization-weighted, selling pressure will be concentrated among the largest names—the same stocks that have benefited the most from inflows into these funds. The average year-to-date return for the 15 members of the Bloomberg North American REIT Index that have a weighting of at least 2 percent is twice the gain posted by the index’s 10 smallest positions. The stocks at the higher end of the capitalization spectrum also sport an average yield that’s less than half the current return offered by the smaller fry. Of course, there’s more to this story. The 15 largest positions in iShares US Real Estate (NYSE: IYR) have outperformed as businesses in 2014, growing their payouts by an average of about 24 percent. How REIT-focused fund products perform in 2015 will depend primarily on momentum related to sector rotation and the outlook for interest rates. Smart investors will avoid these ETFs to focus on company-specific stories, including smaller names that offer high yields and solid growth prospects, nontraditional REITs and underappreciated turnaround stories. The market rewarded selectivity last year when a rising tide lifted almost every REIT. But in 2015, picking the REITs with the most attractive combination of valuation and potential upside catalysts will be critical to achieving total returns that leave the ETFs in the dust. 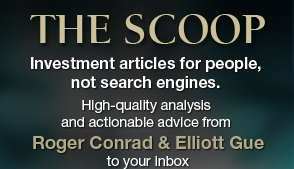 And if investors rotate out of the REIT space, investors who settle for average and buy ETFs will suffer considerably more pain that those who focus on the best company-specific stories. My feature article in the next issue of Capitalist Times Premium will highlight the best REITs to buy for 2015 among the almost 100 names that I track.